Aruba beckons… although small in size, just 30 km long and 8 km wide, this stunning Caribbean island is big on beauty, with long stretches of white sandy beaches, sensuous sparkling turquoise waters and gentle trade winds that caress and cool the skin while enjoying the rays of the tropical sun. We are returning to this incredible island, after many, many years, as our father’s identical twin started the very first hotel here, called the Manchebo Beach Hotel. Aruba has become an incredibly desirable destination with so much to offer and to celebrate including an annual Food, Wine and Art Festival, held at The Westin Resort and Casino, Aruba www.thewestin.com/Aruba right up our alley! We look forward to a having an awesome week of a little r&r, some fun and some seriously yummy eating…accompanied by some fine wines of course!All this with our friends, a group of five, fun loving ladies and foodies. Look out Aruba!, taking in the sun, filled with itinerary is to include a visit to the hotel and a visit to our uncle now residing in neighbouring Curacao. 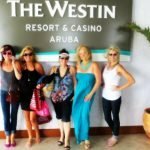 We are to be here Aruba has become an incredibly desirable tourist destination with so much to offer and to celebrate, including an annual Food, Wine and Art Festival, right up our alley! We are welcomed by broad smiles and happy faces with an aim to please. The native “Aruban” speaks three to four languages, is friendly and engaging, “bon bini” is how you are greeted,with Bon dia, Bon tardi, and Bon nochi. One local, Romeo, we met could say this in almost any language knpwn to mankind. This is the vocab from the local language here, Papiamento, a creole language derived from African languages and either Portuguese or Spanish, with some influences from Amerindian languages, English and Dutch. Check out this talented man here. It’s pretty cool! The Wine Ladies Wine Pick, It’s amore! Or is that Amarone?